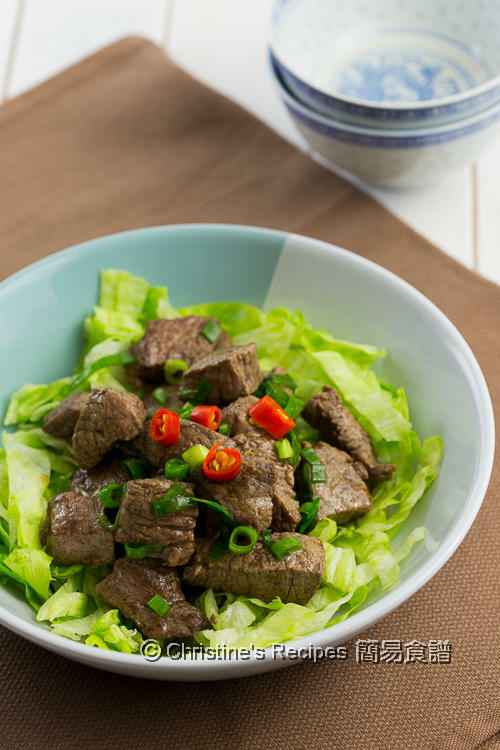 This five spice beef stir is a quick and delicious dish, that only used a few simple seasonings. You might like to add more of your favourite vegetables to go with it. Stir fry dishes are quick to be done and packed with amazing flavours. My daughter likes to name stir-fry dishes are sides, not main. It makes sense to me. If you look at it from another perspective, a stir-fry dish can be a light main dish too. You can pair a stir-fry dish with some more vegetables. It really can fill up your stomach. This five-spice beef stir fry is a case in point. Five-spice powder is a spice mixture of five or more spices, easily found at any Asian stores. It’s quite often used in Chinese cooking. The popular Cantonese roasted pork belly recipe yields five-spice powder. I found beef goes really well with this spice mixture as well. 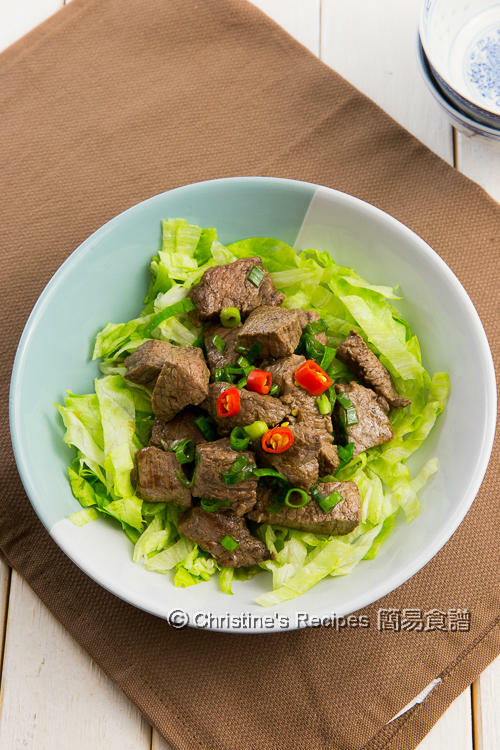 To make this dish, you simply pan-fry the beef that mixed with five-spice powder, salt and pepper. Then sprinkle some soy sauce and Worcestershire sauce. That’s it. A quick, delicious dish is done in a flash. The flavours of this dish are wonderfully attractive. To get best results, beef fillet is preferred. Sirloin steak or rump steak are good choice too. Most importantly, make sure not to over-cook the beef. 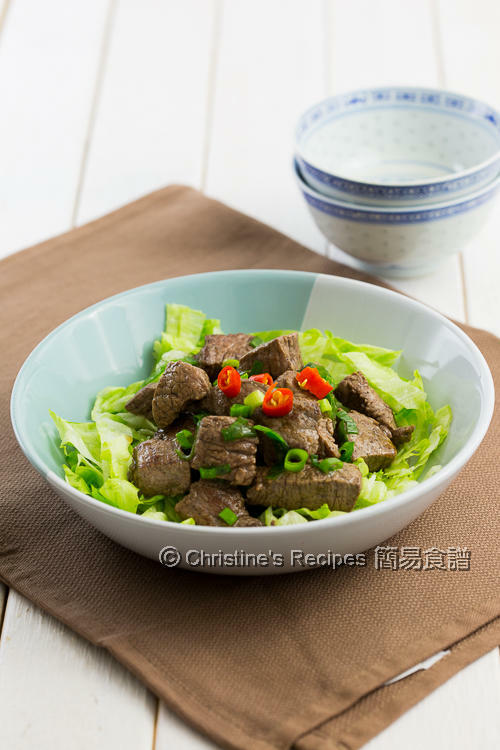 Cut beef fillet into 3-cm / 1-inch chunks. Set aside. Heat oil in a fry pan over medium-high heat. Saute garlic. Don’t burn it. Drain and discard. In the meantime, mix beef fillet with marinade well. Increase heat to high. The fry pan should be hot enough. Quickly place beef fillet in the pan in one single layer, not overlapping each other. Pan fry one side for 3 minutes. Flip over the other side and cook for a further 1 minute. Sprinkle soy sauce and Worcestershire sauce. Stir to combine quickly. Sprinkle diced spring onion. Transfer the beef onto shredded iceberg lettuce. Garnish with red chilli. Serve immediately. Before pan-frying beef, the stove heat should be high enough, and the fry pan is nice and hot. Otherwise the beef will release and lose its juice. Make sure not to over-cook it though. 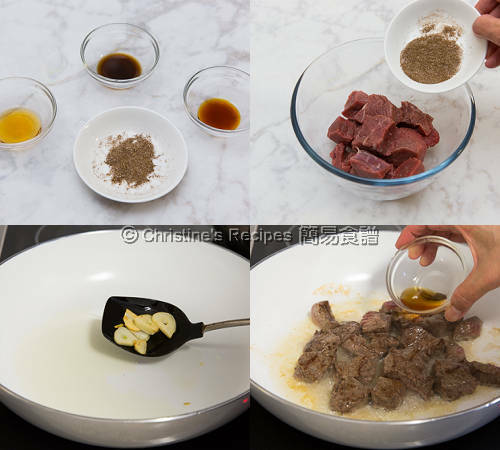 Once the beef is mixed with marinade, pan-fry it immediately. Beef bites look really tender and flavourful! I used beef fillet. It's the best. Any cut suitable for stir-frying is a good choice too, like skirt steak. Christine, please confirm that the marinade for the beef cubes are salt, 5 spice powder and sugar and that the soy and worcestershire are added just at the end before the green onion and chili? Thank for the meal ideas, I am new to your site. Thanks for asking. Yes, you're perfectly right. The marinade are salt, 5 spice powder and sugar. The other condiments are added at the end of cooking.